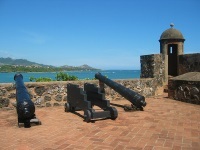 Puerto Plata's only remnant of its Spanish Colonial past is a small fort, situated on a small peninsula in Puerto Plata Bay. The fort, featuring a moat, and a collection of historical artefacts in a small museum, was built in the mid 15th century to protect the bay against pirates. However, it never saw great battle, and was mostly used as a prison. To the east of the fort is an oceanside road known as the Malecon, which features numerous cafés and roadside vendors. It is a popular promenade for walks beside the beach.